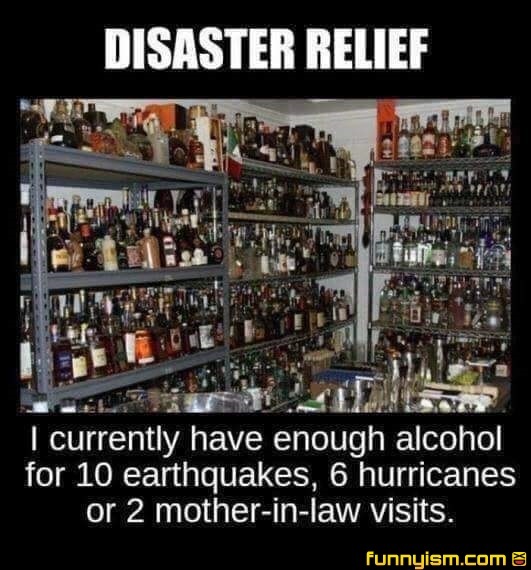 I hate to say it, but none of those bottles would survive an earthquake. I guess you could drink from the super cocktail “lake” with a straw... On second thought, you should be good to go. @DFYANT, Oh he doesn’t live in an earthquake zone - he just likes to get drunk on his sofa and watch the disasters unfold on live TV. @DFYANT, i mean. The lake would be half broken glass shards but ok lol. Painful death it is. Wonder how many people have stocked luxury goods as bargaining chips if society collapses. When people start coming out to rebuild is it going to be on the back of 20 year whiskeys and Cuban cigars? @Captain Anderson, that's why my bunker is filled with desalination devices and toilet paper. I'll trade my way to a smokey drunken apocalypse. @Captain Anderson, does a collection of bottle caps count? And then the first earthquake knocks them all off the shelves. Or for one super stressful day at work.